Dykstra's at it again. 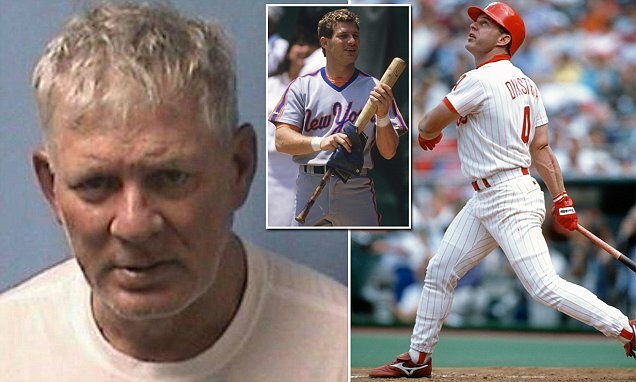 After last year's Pete Rose fiasco, I think it would behoove the Phillies not to make him a candidate for the Wall of Fame. Dykstra, 55, has been charged with making terroristic threats - a felony - and also faces a slew of drug possession charges. He was arrested at 3.30pm on Wednesday in Linden, New Jersey. The only good thing is that he was arrested at 3:30pm. I assumed it would be 3:30am. Actually, now that I think about it, that may not be good that he is like this in the middle of the day, at least at 3:30 am there is some type of reason (not excuse). Sometimes guys that play like they are crazy really are crazy. I think Lenny's Wall window closed long ago, he was already taken out of the mix after he went to jail, and now more recent players are due. For all the talk of Hamels as the Phillies' fantasy trade deadline lefty, what about Happ? He's pitching well and the Jays are already 10 games out. If you want a pure rental. In any case it's good that there are potentially two available (and hey, there's also Kershaw, though I don't think that's a white flag the Dodgers can afford to wave, especially since he's technically under contract). Good point - I'm thinking Happ might be a good pickup. The Twins have released first baseman/outfielder Brock Stassi, per Mike Berardino of the St. Paul Pioneer-Press (via Twitter). Stassi was in Allentown this past week. He has bad stats in AAA, hitting .212 with a ;.632 OPS and DHed the game we attended. He was just one of many nonprospects who created a bit of a stir with one good year at Reading. It wasn't even a .900+ OPS year there and he only had 15 HR -- not really all that great stats for a Reading 1B. We've seen a lot of guys put up better seasons at Reading, with more power. Stassi's career minor league OPS is only .725. Eric Kratz traded to Milwaukee, hits a homer in their demolition of the Mets today. Stassi also had a good AAA year in 2016 and had a nice spring prior to being called up in 2017. His park and league adjusted OPS+'s were 149 in Reading in 2015 and 134 in LV in 2016. It could at least have been argued that he had figured things out and turned into a decent (albeit older) prospect in those two seasons. His walk rate was always outstanding, between 10% and 14%. His 2017 and 2018 seasons have been disappointing with OPS+'s in the 80s. I've always like his excellent defense and strike-zone judgment, but he looks like a career minor leaguer at this point--he's closer to 29 than 28 yrs old. Stassi also had a good AAA year in 2016 and had a nice spring prior to being called up in 2017. Not sure I would say good. 806 OPS at age 26 in AAA is merely passable for a 1B. Realistically it gave him a potential major league job as a bench bat or a platoon 1B. But since bench bats generally need more defensive value in the NL he really needed to look for a job in the AL. And even then his offense was marginal for that role. Now he probably collapsed more in the majors than his stats might have suggested, but the majors are a step up in quality and that often happens. 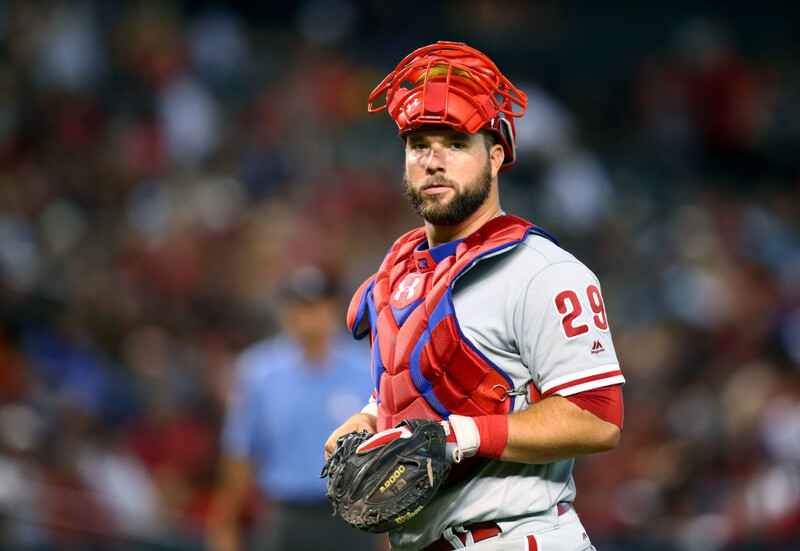 Next stop Korea to join Darin Ruf? OPS undervalues OBP. Stassi was 34% better than the average IL player in 2016 according to OPS+. Equivalent MLB first-basemen last season were Jose Abreu, Ryan Zimmerman, and Anthony Rizzo. And Stassi's 2016 was better than that because his OBP was relatively higher. Stassi was the 7th highest qualified player in the IL in OPS in 2016, and 4 of the players who finished higher than him were AAA veterans who were in their 30s. That's a great season in the IL, even for a 1B, and Stassi was a gold-glove 1B to boot. He's now fallen into the AAA vet category, but he did have a couple shining moments, both in Reading and in Lehigh Valley. But he was 26 in 2016 in AAA. None of those major league comparisons mean anything as they are comparisons to players in the majors (who left AAA at early ages except for Abreu who was in Cuba). Being 34% better than the average international player in OPS is probably what 1B are expected to do. And he probably was not 34% better than 26+ year olds. What Joey Meneses (also age 26) is doing this year is a bit more impressive (SSS of course). Higher OPS (986) and more power. Of course he has multiple strikes against him. Age. Right-handed-ness. Lack of track record. No improvement in BB/K ratio. Really high BABIP. If he settles down into the 800-850 OPS range it is just another nice season from a 26-year-old in AAA rather than an actual prospect emerging. Rupp opts out. Gotta admit, Phillies could do worse at this point, though I'm sure they prefer Knapp's switch-hitting and upside, and still don't rate Rupp's defense (and neither did anyone else). The Texas Rangers have activated Carlos Tocci from the disabled list. My apologies if this has been posted elsewhere. Don't apologize. This is the proper thread for this news. If somebody else put it in the wrong place, that's on them; it's not your responsibility to see if somebody decided to dump this news in the "one thread to rule them all" that some people might prefer. I get what Jeff means though - Tocci's status as a player for the Texas Rangers is provisional, and that status will remain relevant to the current team (and minor league roster) until this season is over. So it would be perfectly reasonable to have this news in one of the other threads. If I was a fan who didn't really care what Cameron Rupp or Jayson Werth or Cole Hamels was currently up to, and therefore didn't often read this thread, I might still care about Tocci. And it still is probably 50-50 Tocci returns at some point in the next month or two (if he gets to August I am guessing he is staying). There was debate on the Ranger sites this week about whether he would be returned. It is not like he is playing that well in the majors. True but he doesn't have to play well. What is he going to do hurt their draft pick? Very true, Z -- the Rangers have already kept him through the part of the season during which the Rangers and their fans can still squint and see a small shot at contending for a playoff spot. It's much easier to keep him for the rest of what is now regarded as a lost season.